The SmartBots Group Export routine has been improved to contain the last login date of the resident. 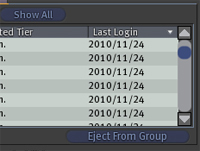 The export results are now sorted by login date too, which allows to quickly filter active Second Life group members. Current group export price is L$1 per member. Exporting allows you to use the list for any business or marketing purpose, like opt-in mailings etc.